I absolutely love all of them. Is a secret fantasy that I would one day have a villa for nice vacations, be it at seaside or at the mountains. That house would have A LOT of white accents. The images below remain my inspiration, in case I win the lottery!!! I love the unmatching chairs with their rustic feel. 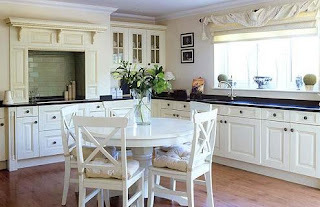 This is dreamy, if I had this kitchen I would always buy fresh white flowers for the island. This one is very traditional, but the chair pillows gives it such a warm feeling. Wouldn't you love to have a late Sunday brunch in this space? 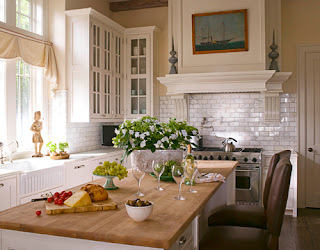 This unconventional, yet simple choice has so many beautiful details: the tall stools (made rustic again), the small mobile island, the beatiful fridge and big bench for all your friends. 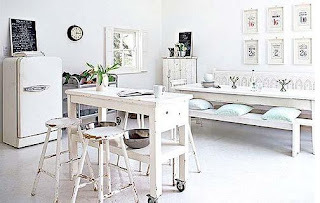 Everything is well-chosen, but is not over the top: the wall-art, chalboard and simple clock. In this last photo, everything looks so steady and put-together. I appreciate the beatiful walls with the brick/stone trend that is so popular these days. The place to be. Get your daily dose of beautiful and find simple ideas for decorating, shopping and home diy.